Mickey Mouse is featured all over Walt Disney World, other Disney Parks, and throughout the world. Of course, there are also lots of Hidden Mickey’s around. 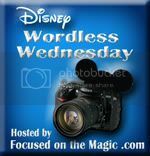 This time around the theme of the Disney Wordless Wednesday is Mickey Mouse. As you will see, I had a wide variety of Mickey Mouse sightings from some recent visits to Walt Disney World. Loved all the pictures! The giant Mickey Phone brings back such great memories and love the Mickey kiss! Great pictures of Mickey! Love seeing Mickey all around the World! Your little cutie with Mickey kisses is adorable! Thanks so much for sharing and for joining in on the DWW Blog Hop fun! Happy Thanksgiving!! Mouse kisses are always the best. :) Great shots! Seeing all of these Mickey pictures has been so fun, because he has so many different outfits! I love the red and yellow one! These are great! I loved looking at all of them. That Vinylmation Mickey would be cool to see in person.